Lord Bhairav is an fierce incarnation of Lord Shiva.The term Bhairava means “Terrific”. He is often depicted with frowning, angry eyes and sharp, tiger’s teeth and flaming hair, stark naked except for garlands of skulls and a coiled snake about his neck. In his four hands he carries a noose, trident, drum, and skull. He is often shown accompanied by a dog. Lord bhairav’s worship is very useful to win over your enemies, success and all materialistic comforts. 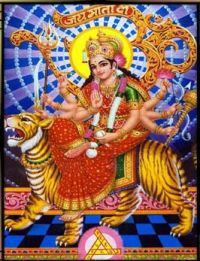 It is very easy to please lord Bhairav by doing normal worship daily. Lord Bhairav guard the Lord Shiva temple, due to which He is called “Kotwal” also. 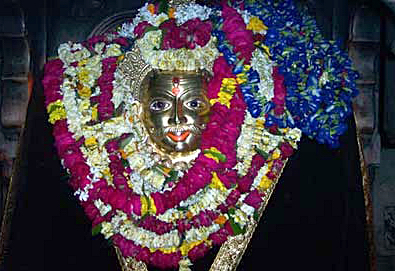 Batuk Bharav is the most worshipped form of Bhairav in tantra. Lord Bhairav protects, removes all obstacles, cleans the soul with his sheer intensity and makes things favourable for a sadhak. He is one of the most feared deities, but actually, he is one of the most rewarding.The vahana (vehicle) of Lord Bhairava is the dog. Dogs (particularly black dogs) were often considered the most appropriate form of sacrifice to Bhairava, and he is sometimes shown as holding a severed human head, with a dog waiting at one side, in order to catch the blood from the head. Feeding and taking care of dogs is another way of showing our devotion to Lord Bhairava.